ICPO Policy & Information Officer Ciara Kirrane outlined the challenges facing former prisoners returning to Ireland to the Committee on Foreign Affairs and Trade on 29th November 2018. See the ICPO’s statement to the Committee here. Read an Irish Times article here highlighting the challenges facing returning emigrants as outlined by ICPO, Crosscare Migrant Project and Safe Home Ireland. 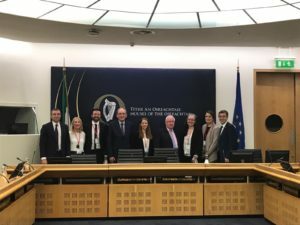 Members of Committee on Foreign Affairs & Trade meet with representatives from ICPO, Crosscare Migrant Project and Safehome Ireland.